Irish coins have been issued by a variety of local and national authorities, the ancient provincial Kings and High Kings of Ireland, the Kingdom of Ireland (1541–1801), the United Kingdom of Great Britain and Ireland (1801–1922), the Irish Free State (1922–1937), and the present Republic of Ireland. Some modern British coins have Northern Ireland symbols (such as flax and the harp) but these are circulated throughout the UK. Hiberno-Norse coins were first produced in Dublin in about 997 under the authority of King Sitric Silkbeard. The first coins were local copies of the issues of Aethelred II of England of England, and as the Anglo-Saxon coinage of the period changed its design every six years, the coinage of Sitric followed this pattern. Following the Battle of Clontarf in 1014 the Hiberno-Norse coinage ceased following this pattern and reverted to one of its earlier designs—the so-called 'long cross' type. Coins of this general design (with occasional new designs incorporated briefly from other English and European issues) were struck in decreasing quality over a period of more than 100 years. By the end of the series the coins had become illegible and debased, and were too thin to serve for practical commerce. All the coins produced were the penny denomination. They were initially produced at the penny standard (i.e. one pennyweight or 1/240th of a pound of silver) but the later pieces are both debased and lightweight. These coins were issued by Baron John de Courcy, Earl of Ulster. The coins which followed the Norman conquest (farthings, halfpennies and pennies) were minted to the same standard as those of England. A chief purpose of these coins was to provide a means for the export of silver from Ireland. Later pieces followed the standard of England until 1460 when a lower, Irish standard was introduced with coins weighing ¾ of their English counterparts. This coincided with the introduction of a larger denomination, the groat (4 pence). Half groats followed in 1483. Edward VI issued the first Irish shillings following debasement of the coinage during the reign of Henry VIII. Prior to the reign of King Henry VIII (1509–47), the Irish coinage carried the title 'Dominus Hiberniae' (or Lord of Ireland). After 1535, Henry took the title King of Ireland. In 1561, Elizabeth I introduced a higher standard of silver coinage for a few years before returning to a base standard. Copper halfpennies and pennies were also introduced. Higher standard issues were resumed by James I but all Irish issues ceased in 1607. During the English Civil War, a number of local coins were issued in Ireland. Copper halfpennies were struck between 1680 and 1689, during the reigns of King Charles II (1660–85) and King James II (1685–88). These coins were struck by the deposed King James II after he fled to France. These coins are unique because they show the month of issue as well as the year. As there was a shortage of metal for coinage, church bells and possibly old cannon were melted down, thus giving rise to the name Gun money or Gunmoney. These coins were declared illegal tender after King William III's victory at the Battle of the Boyne in July 1690. A second issue of emergency coinage, consisting of farthings and halfpennies, was issued in 1691 for use in Limerick. Wood's halfpence coin, obverse and reverse. William Wood was authorised in 1722 to produce up to 360 tons of halfpence and farthings for Ireland at 30 pence to the pound over a period of fourteen years for an annual fee of £800 paid to the king. These coins were unpopular in Ireland, largely due to Jonathan Swift's polemical Drapier's Letters, and Wood lost his patent though compensated with a pension. After the end of the English Civil War, copper farthings and halfpennies resumed production, and pennies were added in 1805. In 1804, the Bank of Ireland introduced silver tokens for 6 shillings which were overstrikes on Spanish dollars. These were followed by 5, 10 and 30 pence Irish tokens. The last halfpennies and pennies were minted in 1823. The 1822–23 issue marked the last appearance of the symbol of a crowned harp, which represented the Kingdom of Ireland. Following this, standard British coinage was used throughout the island. The new Irish Free State circulated new national coinage in 1928, marked Saorstát Éireann (Irish Free State), although British coinage was still acceptable in the Free State at an equal rate. In 1937, when the Free State was supplanted by Ireland, the coins became marked Éire and the Irish pound remained pegged at par to sterling. Both Ireland and the United Kingdom decimalised their currencies in 1971, and parity between the two currencies continued until Ireland joined the European Exchange Rate Mechanism in 1979. An exchange rate between the Irish pound and the pound sterling was established on 30 March 1979. 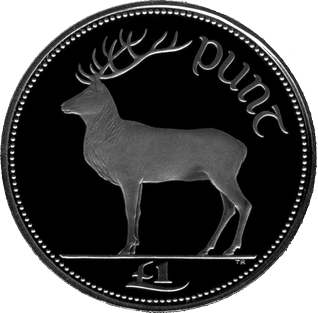 The smaller denomination British 1p and 2p coins continued to be unofficially interchangeable with the Irish coins until the euro was introduced in 2002, partly due to their identical size and shape. Ireland adopted the euro as its currency along with most of its EU partners on 1 January 2002. The national side of the Irish euro coins bears the coat of arms of Ireland and the 12 stars of the EU, the year of imprint and the Irish name for Ireland, Éire, in the traditional Irish script. These coins circulate throughout the eurozone. Northern Ireland has continued to use British coinage since the partition of Ireland. The British one pound coin has featured varying designs to represent England, Scotland, Wales, Northern Ireland, and the UK as a whole. The 1986 and 1991 issues featured a flax plant in a coronet, the 1996 issue featured a celtic cross and flax flower, and the 2006 coin featured MacNeill's Egyptian Arch all representing Northern Ireland within the United Kingdom. These coins are not unique to Northern Ireland and circulate through the entire United Kingdom and other sterling area countries. Irish coinage website – history, images and catalogue. The British West African Pound was the currency of British West Africa, a group of British colonies, protectorates and mandate territories. It was equal to the pound sterling and was similarly subdivided into 20 shillings, each of 12 pence.